There have been no important economic reports therefore EURUSD is massively under the influence of Trump’s speech. The support rests at 1. 05600 with resistance at 1.06530 which both lines are above the weekly pivot point at 1.04960. The EMA of 10 is moving with bullish bias along the ascendant channel and it has reached the EMA of 200; they are both above the EMA of 100. The RSI is moving in overbought area, the Stochastic is moving in high ranges and the MACD indicator is in positive territory. The ADX is showing a buy signal. 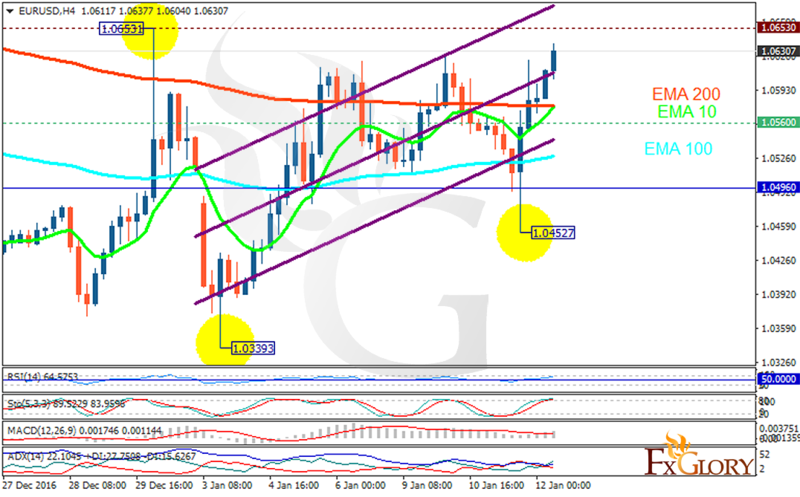 The resistance level is not going to be broken therefore sellers can make profit by pullbacks targeting 1.050 area.